Recent studies reveal that overexposure to UV and harmful high energy visible (HEV) blue light from the sun, and harmful HEV blue light from electronic devices can be very damaging to the eyes. Cataracts, macular degeneration, photokeratitis, pterygium, and eyelid cancers are just some of the conditions that can result from either too much UV light or harmful blue light. The new premium performance ROYAL AR coatings offered by Robertson Optical Laboratories feature superior protection against UV radiation through UV reflectors. This UV coating technology provides UV reflective properties on the front side of the lens and UV transmitting properties on the backside of the lens that addresses UV from platform reflecting back into the eye. 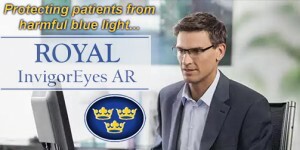 The new ROYAL InvigorEyes DES AR™ and ROYAL RB Tech AR/UVR/HEV™ offer protection against UV and harmful HEV blue light. This coating combines the above mentioned UV coating technology as well as HEV blue light reflective technology on the front side of the lens paired with HEV blue light transmitting properties on the backside of the lens that addresses both UV as well as HEV blue light from platform reflecting back into the eye. These coatings include easy-to-clean super hydro or hydrophobic top coats and anti-static technology, front and back double hard coats for elite scratch resistance, as well as a non-slip pad control coating for easy edging. Included in the ROYAL AR premium portfolio of coatings are: ROYAL InvigorEyes Retinal Bliss DES AR™, RB Tech AR/UVR/HEV™, ROYAL EliteAR/UVR™, ROYAL GARD AR/UVR™, ROYAL UltraClean AR/UVR™, and Royal Jr.
• Healthy Eyes: The potential for eye damage associated with reflected UVA and HEV rays is greatly reduced. • Better Vision: More light passes through patients’ lenses to help reduce glare. ROYAL AR coating makes night driving safer, along with reducing glare from the computer screen. • Better Appearance: Even through their eye glasses, patients’ eyes are clearly seen by others rather than the interference of distracting reflections. -is the premier lens coating that addresses the direct influences of Digital Eye Strain caused by HEV blue light. –provides a selectively reflective front-side coating that is engineered to reduce glare associated with digital devices while also reducing the negatives effects of both environmental and artificial lighting sources. –is a premium anti-reflective coating. Combining Polycarbonate with ROYAL Ultraclean AR, ROYALJr is the result of the increasing need for a turnkey pediatric lens product. Combining both the technologies of polycarbonate lenses and ROYAL Ultraclean AR, ROYALJr produces an everyday solution for pediatric patients. Robertson Optical has been offering a family of privately labeled ROYAL AR lenses since 2013. 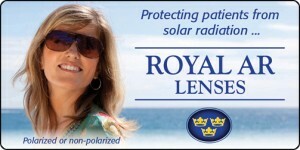 Not only does the ROYALJr lens provide the reassurance of impact resistance, it reduces the hazards of glare. 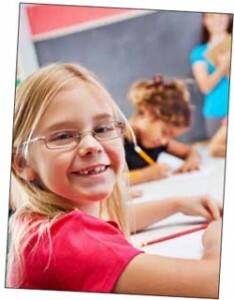 Studies show that children who have anti-glare lenses perform better in school and have higher test scores. ROYALJr lenses benefit ECPs by offering a simplified tool to better address the evolving visual demands of their pediatric patients. For more information on these coatings, contact a Robertson Optical lab. 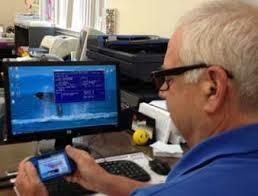 Mike Fussell is the Sales and Customer Service Manager of Robertson Optical of Atlanta in Loganville, Georgia. The Lens Leader: Mike, you’ve said that you think the new InvigorEyes AR lenses are remarkable, why? Fussell: I recently had a pair of InvigorEyes lenses made for myself just to see how these worked. I was amazed at the clarity I get with this product compared to our ROYAL RB Tech product, which is very good in its own way. I feel like everything is more defined with the InvigorEyes product, especially when looking at my computer screen. I’m also finding that after just one week, my eyes don’t seem to be as tired at the end of the work day. Believe me when I say this, I’m on computers all day long, and I’m already seeing the benefits of InvigorEyes. The Lens Leader: How are Robertson Optical customers responding to InvigorEyes? Fussell: A customer walked into our lab the other day and asked me why my lenses had a bluish color to them, so I told him I was wearing the new InvigorEyes AR lenses. I described the features of this product, stressing the clarity and definition. I told him that in the optical industry, we’ve been increasingly hearing about the effects of bad blue light on people’s eyes, especially from digital devices. He said in his opinion it was all hype, so I asked him to try InvigorEyes, so he agreed. After receiving and wearing his new lenses with InvigorEyes, he called me and said, “I hate to make this call, but I was wrong. This is the best coating I have ever worn.” He said this all makes sense now. He agreed with me about the clarity and definition. The Lens Leader: What do you think the future holds for InvigorEyes? Fussell: Personally, I think this is a major breakthrough in anti-glare protective coatings, and I really believe that every lens order should have this product applied to the lenses. I know it adds to the cost, but the results speak for themselves. Since we are in the health care business, it’s our duty to protect our patients’ vision.